There's a slim (but not insignificant) chance that an asteroid will hit the Earth some time in the next 100 years, causing an extinction-level event. But we're not willing to invest the relatively modest sums needed for a detection and deflection system. It's not just that we humans are shortsighted and in denial. Rather, it's that humans may be hardwired to place more value on a human life today than one 100 years in the future. For example, one government agency considers three lives in 2011 worth roughly the same as 100 lives in 2061. Why is this? Top image: Asteroid collision by David Hardy. We like to pretend that life is "priceless" – and it's true that people cannot be bought or sold legally – but we estimate the value of a human life, in monetary terms, every day. Many government funding decisions, not to mention the cost of some types of insurance, rest on how much a particular life is worth. And there are formulas that determine how much more valuable your life is than the lives of those who are yet to be born, or the lives of those who will live 50 or 100 years from now. How much is a single life worth? Remember Jack from Fight Club? Jack works as a recall coordinator for an automotive company. He visits car crash sites and determines the average value of a cash settlement for a person killed due to a manufacturing flaw versus a full scale recall to fix the flaw, and if "X is less than the price of the recall, we don't do it." You can check the clip out, if you want to re-watch this amazingly frank scene. This valuation method of human life is not far from the truth. The cost to avoid a single death can be quite high – judging from a recent Environmental Protection Agency project aiming to remove arsenic from drinking water and forgo bladder cancer in a small part of the population. Each life statistically "saved" accounted for $6.1 million (in 2002 dollars) of the initiative's budget. This value is used by the EPA for several analyses, often fluctuating, with the value of saving a single life dropping to $5.5 million in 2003 air regulations, but rising to $9.1 million in 2011. The value of an elderly person's life is discounted in the calculation of the value of these statistical "lives." The Department of Transportation statistically values life as well, setting the value of a statistical life at $6.2 million in a 2011 memo. In 2009, the EPA attempted to drop the "value of life" terminology in lieu of a cash value per risk reduction, a value that takes into account roughly 100,000 micro-risks a year over a lifespan. How much do we spend to prepare for the future? Let's compare the money nations spend preparing for extreme future disasters – extinction-level events, like asteroid strikes and nuclear war — versus current health and physical maladies. Any amount of discounting compounded over several years quickly devalues future human lives. For example, a five percent annual discount rate results in a single life in 2011 being worth one billion lives in 2411. This is not at all an overestimation — the Office of Information and Regulatory Affairs set the current annual life discount rate at seven percent, making 100 lives in 2061 worth a little over 3 in 2011. 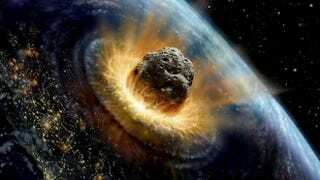 Which brings us back to the lack of funding for research into observing asteroids and deterring those that would cause an extinction level event – killing everyone on earth, and thus everyone who would be born generations in the future. The probability of such a strike might be low — and it's been postulated at one in a million during the 21st century — but it's still a risk, and one that would cost untold present and future lives. NASA estimates that an advanced detection and deflection system would cost $20 billion to create. In comparison, the United States government spends $5 billion annually to stockpile drugs and vaccines to monitor and deter biological attacks. The money spent to deter a possible biological attack on North American soil poses a considerably less than extinction level threat, with a little over 300 million lives exposed. When it comes to spending money at the government scale, future lives are essentially worthless. We spend a considerable amount of money to save those in our generation or the one directly after us – this can be seen just by looking at the NIH and NSF budgets. The NIH revolves around research to improve health and quality of life, with its $31.7 billion 2012 budget coming in at more than quadruple the 2012 NSF budget. The NSF funds basic science, which may not be immediately commercialized or applicable, but often has a profound impact on future generations and later NIH work. Is it bizarre to value future lives so little? Is this perverse? I'm not so sure. We often value tangible goods and commodities available now far more than goods that we could find way more valuable in the future. Personally, I'll shell out $60 for a video game and $30 for a stack of comics, yet I never get around to dropping $90 on a case of twelve MREs (Meals Ready to Eat), food with a several year shelf life that I could used to feed myself, should a biological or nuclear attack occur. A low probability, yes — but something much more valuable and life sustaining than two hours of comic book reading, and a video game I'll play for a few hours and probably flip on eBay. Immediate deterrent or benefit trumps preventive measures in the "extreme" future in our personal lives, just as they do in the hands of government organizations. As it stands now, life in the future is cheap.